Mystical Images Landscaping can help you create a landscape design that gives you and your family a beautiful yard to enjoy. 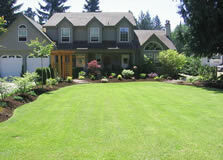 We work with you to make sure that your landscaping is an extension of your home and your style. Types of landscape include shrub beds, lawns, retaining walls and patios, garden stairs, and vegetable gardens. The 3 basic steps of our design process are: Site visit with customer: We visit your property to meet with you and view the site. We discuss your requirements and ideas, and suggest options to make your needs work with the properties size and conditions. 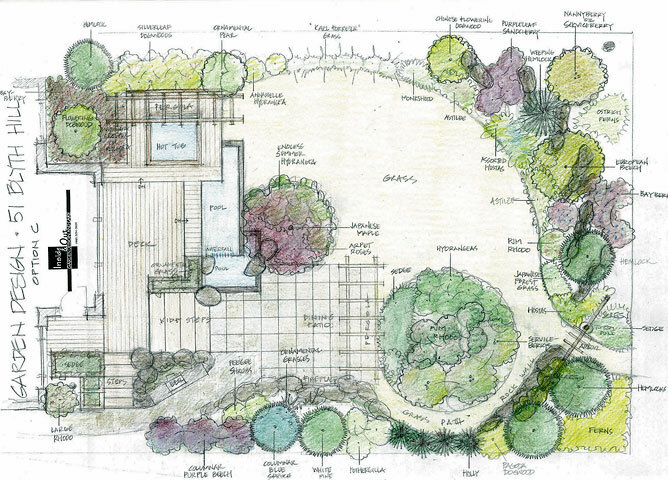 Design your garden At this point we can discuss details and specifics. We will then provide you with an estimate based on what we have discussed. We get to Work Us, with our team, work hard to provide you with a beautiful space in a timely fashion. Sometimes a new and fresh look is the answer to an old and tired garden. Renovation can be a complete transformation of the existing area, or can be a specific area that needs something new, or a face lift. 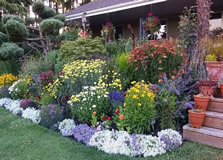 Borders can be redone with a new design if necessary; trees and shrubs can be cut back, removed or moved; new plants can be added; vegetable gardens installed and/or renovated; and lawns can be rejuvenated or redone. We will work with you to design a new look working with the existing landscape, and provide you with an estimate. Our team will breathe new life into your existing garden. Retaining walls are a practical element to include into any landscape. Not only can a retaining wall beautify the landscape, they also offer the ability to separate space and create a unique usage of the land. With all the hills around Vancouver Island, retaining walls are a very common means of leveling a sloped area to make it more usable. 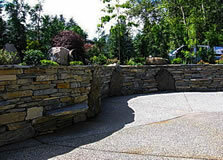 There are many different type of materials and construction methods available to build a retaining wall. Whether stone, pressure treated wood, or pre-cast concrete blocks; it is crucial that retaining walls be installed properly. Mystical Images has the knowledge and experience to build a great looking retaining wall that will last for decades to come. Rock gardens can bring a natural, rugged beauty to any yard. Although there are several traditional styles of rock gardening, most gardeners use their own landscape as inspiration when designing their rock garden. 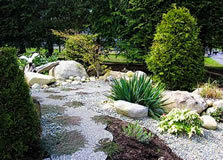 Designing a rock garden around the existing landscape can be fun and rewarding, but new ideas can also be implemented. Mystical Images has the expertise to create custom designed rock gardens featuring many different types, colours and shapes of rocks and fillers. We will work with you to create a landscape that is an extension of your home and your style. Rather than upgrading to a larger home, many people are looking to expand their living space outdoors. As a result, patios are becoming larger, more luxurious, and more sheltered. Outdoor patios have become hubs of activity geared towards entertaining and relaxing. A well-designed patio will not only add additional living space to your home, but will also increase its resale value. Since your patio will provide the foundation for your outdoor living space, it will need to be durable, well-constructed and attractive. There are a variety of patio designs and paving materials to choose from. Mystical Images can help you determine what size, shape and style that best suits your needs. 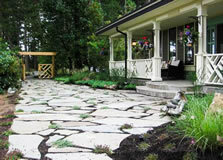 When landscaping a yard, walkways can be used to tie a garden together, and be practical as well as attractive. Not only do walkways guide people throughout your yard, they can also be used to create a mood or atmosphere. Whether they are made out of stone pavers, crushed rock, mulch or flagstone, Mystical Images can design and install paths or walkways to add continuity and flow to your landscape.